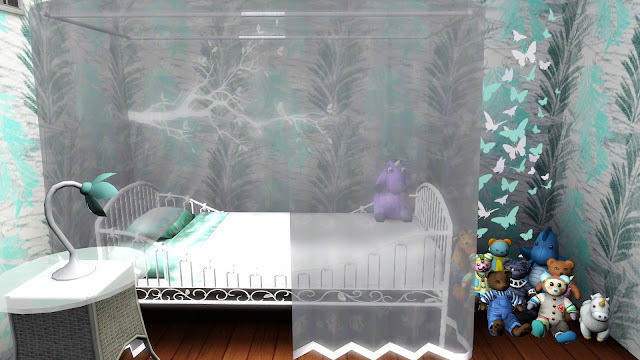 Welcome back to Hadley's Sliding Door Challenge! I'm slowly losing my sanity the more I write these chapters and the next time SimNaNoWriMo rolls around, there's no way in hell I'm signing up with two stories. I have now learned that I still get a gold medal if I only get to gold on one story and so I have relaxed a bit. I'm also sick with ear infections in both ears so this update may be more confusing than usual. The twins are aging up! 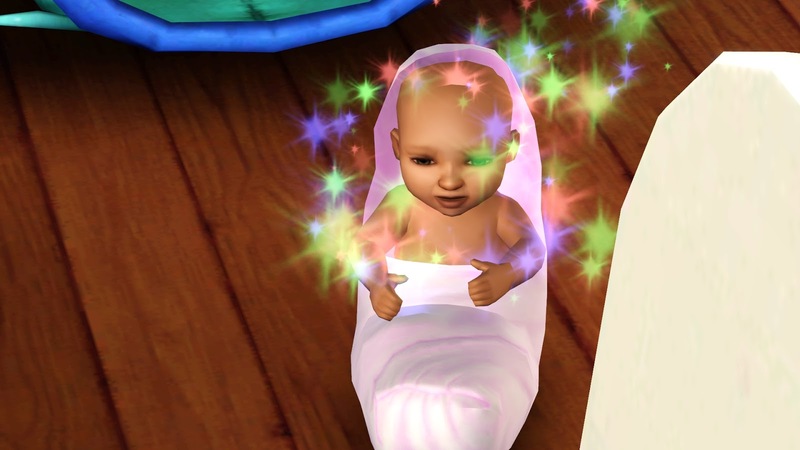 I didn't get much pictures of them as babies because that would have gotten tedious. This is little Kaiya. She's got her momma's hair and her father's eyes. Her favorite color is turquoise. Now this is Zion. Her favorite color is seafoam and she's seems to be the less serious one out of the two. 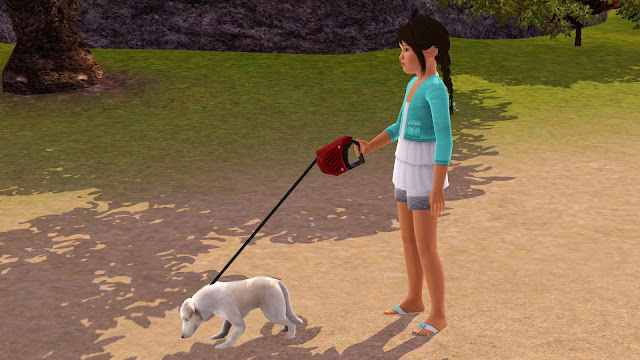 It's kind of funny because Kaiya is the one with the Excitable trait. Maybe that will show itself more later. 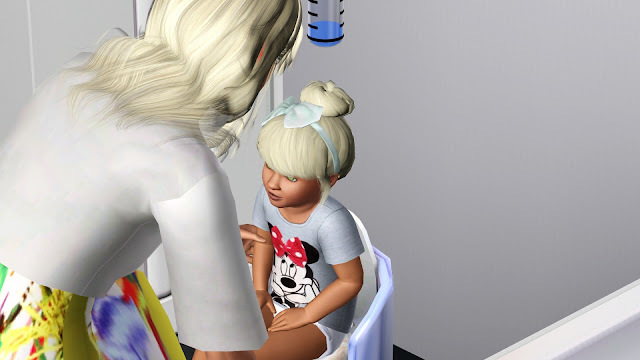 Hadley had a wish to potty train Zion so that's exactly what happened. Daniel was at work and I'm pretty sure Hadley is well on her way to getting the stir-crazy moonlet. 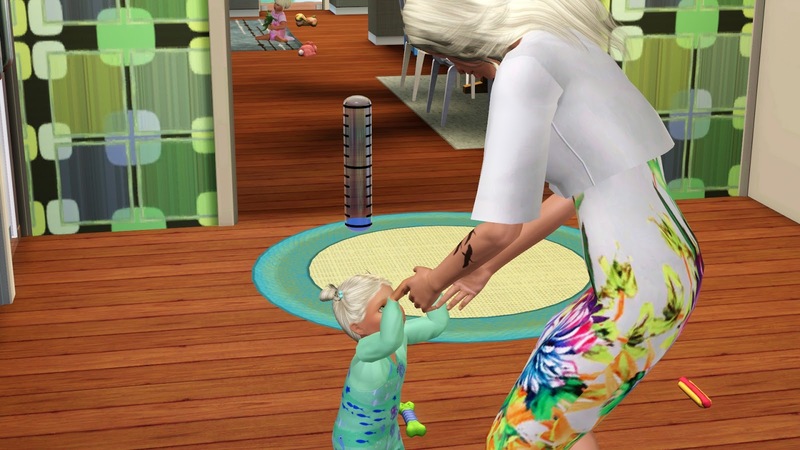 After teaching Zion how to walk, she taught Kaiya how to walk. Two wishes were complete and the twins were on their way to aging up well. Daniel had to befriend his coworkers and so he befriended this pudding face, Henry. "His name isn't Henry! Uh...what's your name again?" "I just told you my life story and then whacked you with a pillow. You forgot my name?" "Of course not! I thought she meant that random guy over there." After Daniel came home from work-wait, Daniel is there, right? Wow, well it's Emmaline's birthday today! She gained the Supernatural Fan trait. This is Emmaline's room and I'm in love with it. As her favorite color is Turquoise like Kaiya's, I tried my best to use that color as much as possible without it overwhelming the room. The first wishes Emmaline got was to use the telescope and learn the logic skill. 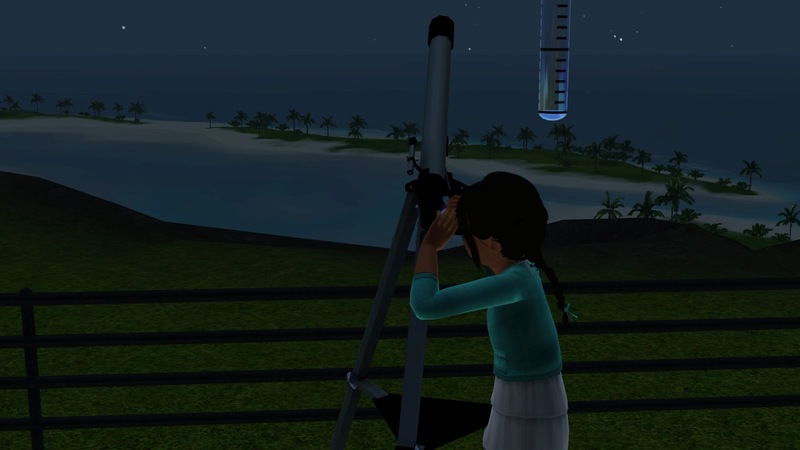 Killed two birds with one stone and BAM she's learning the logic skill AND using the telescope. "Sounds violent. Please don't kill birds." Icarus is plotting and I love it. 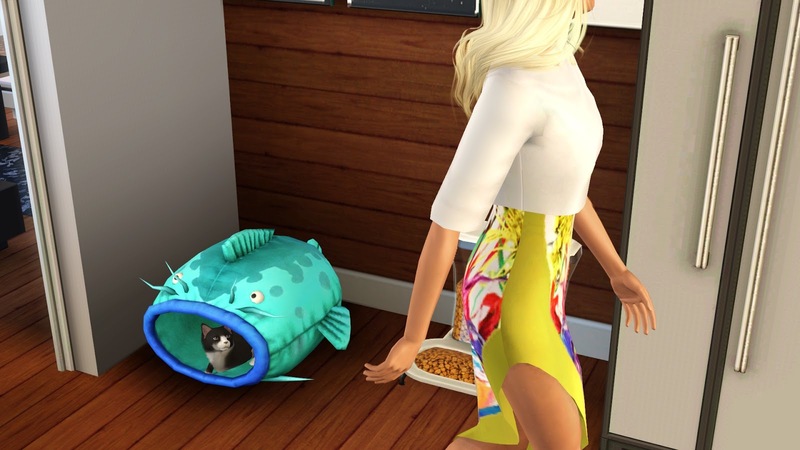 He just hides in his fish and tries to smack people with his paws. Emmaline went on a field trip to the bistro and was apparently picking up knives. 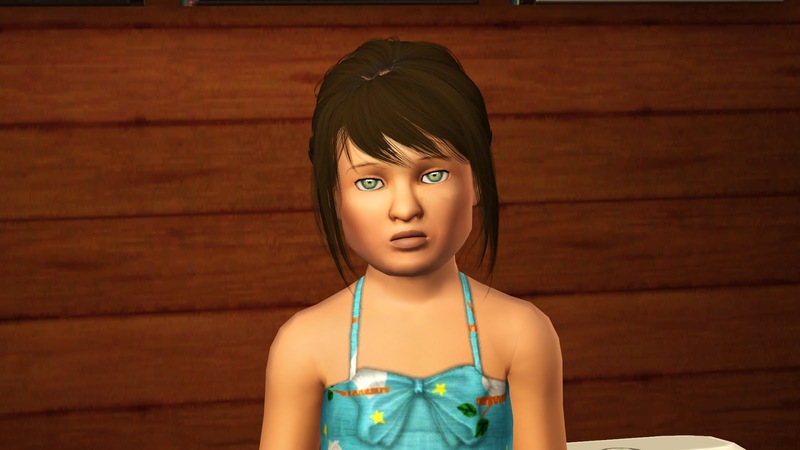 I feel like that just makes her Hadley's daughter even more. Speaking of school, Emmaline signed up for scouting! 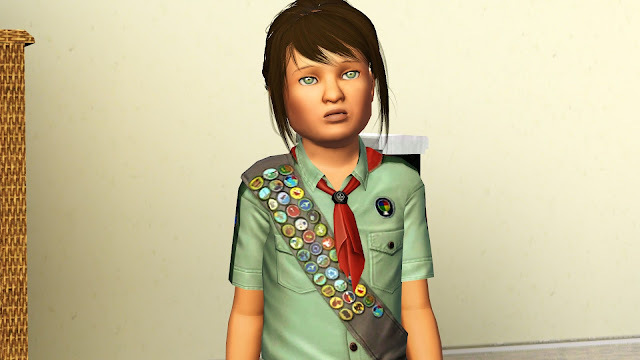 She now shows off the badges she has and it's the cutest interaction. AWWWWWW. Kaiya learned how to talk. "...and that's why you shouldn't stick a fork in an electrical outlet." Emmaline asked to be read a bedtime story and what does Daniel decide to read her? A handy book. "Da-da!" Yes! Progress, if a little, has been made. I don't know why her skill bar is less in this picture, but hey, she still learned how to talk! Speaking of learning new skills, Kaiya is currently being potty-trained. "Writer, what if I burn my eyebrows off?" If it happens, it happens. You can always draw some back on. 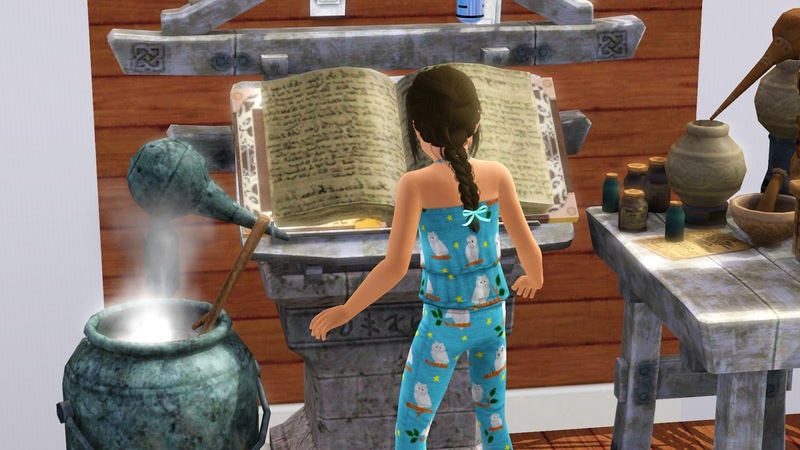 Emmaline had wish to learn alchemy and buy an alchemy station so naturally, her wishes were granted. 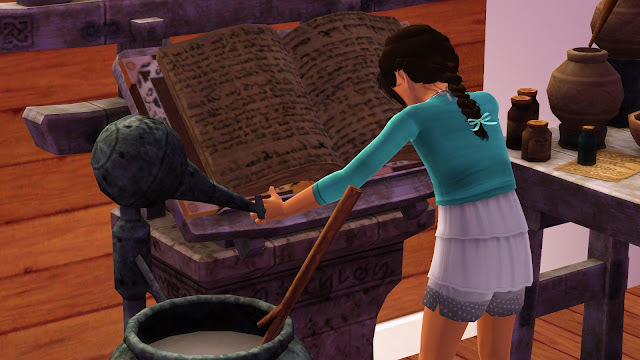 After spending some time brewing up potions, Hadley dragged her away long enough to help her with her homework. "Mom, I don't really know why I'm writing these answers on a ruler." 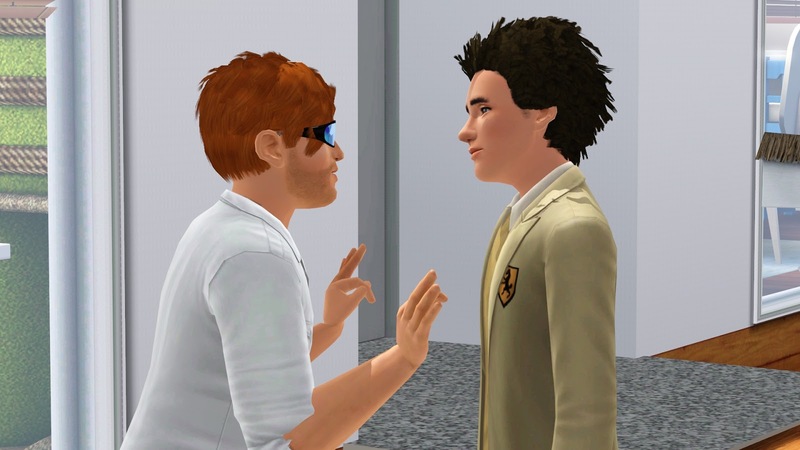 "I just thought it was a new fangled teaching method people my age weren't suppose to understand." Her homework complete and where does Emmaline go back to? That's right, her alchemy station. So far no burnt eyebrows. She stays there until she has to go to bed. "Wee! 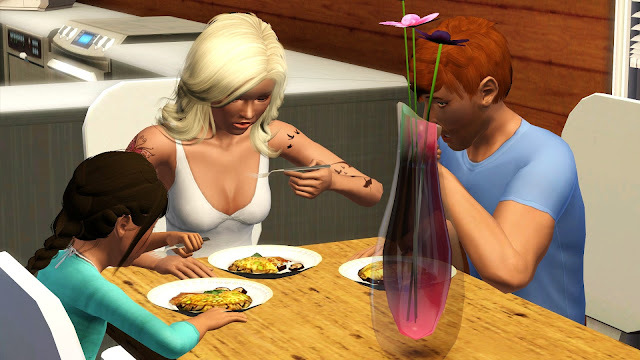 We have food for breakfast!" "Yep, Emmaline. I want to celebrate going back to work and try to make breakfast every morning...or feed you guys the leftovers from the other day's breakfast." I missed no longer playing the daycare profession actually. Even if the children all seem to blend together. 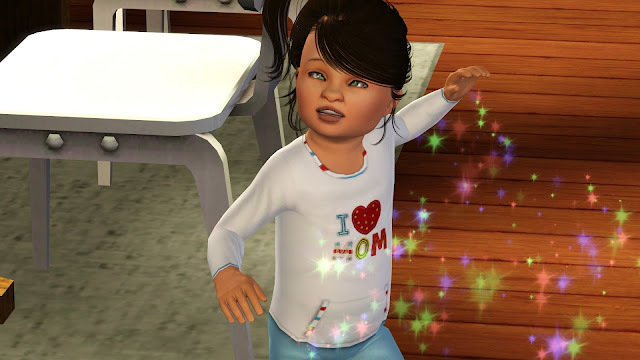 Oh and this child's name is Stacey by the way. She looks like a Stacey so she is a Stacey. Look at this! Look at this toddler hug! I'm going to die from the cuteness! Hadley was giving this little child some attention. What? You mean YOU don't remember? "Usually I just say 'hey it's not their name' and you come up with something to call them." Fair enough. This child's name is Larry. Uh...Emmaline what are you doing? "I wanted to walk Ixon!" Ixon doesn't seem to be doing much walking. Look! 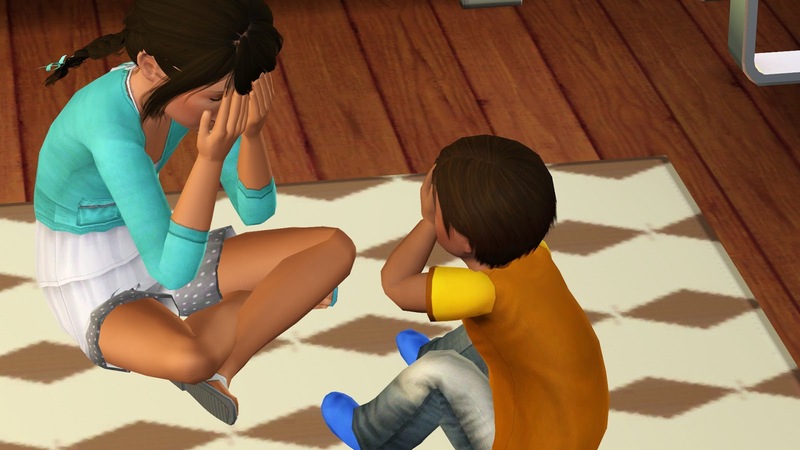 It's our first kid that has to be watched! Of course you do. It's Amy. Welcome to the story, Amy. "So Amy, what do you need help with?" "Just tell me the problem, dear." "If Tommy gives Rebecca 10 oranges, how much time does it take for the world to be destroyed due to lack of apples?" "Hmm...that makes no sense. Do you have a calculator?" Awww! Emmaline decided to help out Hadley with all the kids. I think Larry had to stay later because his parents were late. 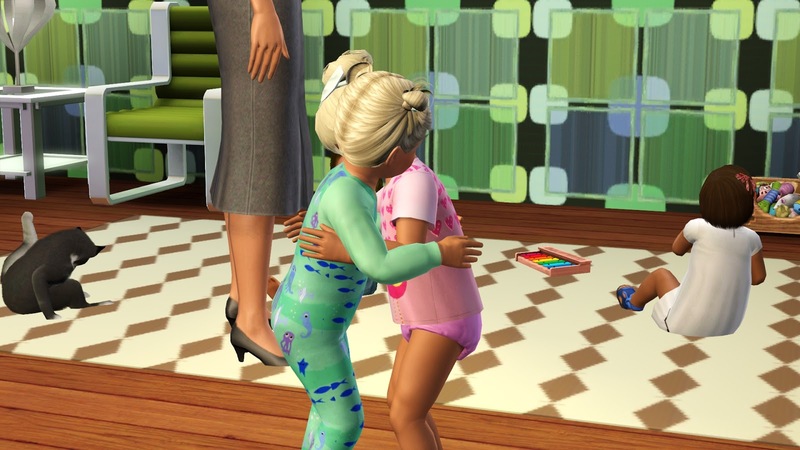 Once all the kids were sent home, Hadley put Emmaline to bed and read her a bedtime story. IT MIGHT BE THE WRONG BED, BUT IT STILL IS CUTE. Well, in the next chapter Hadley is having a bachelorette party!